Product prices and availability are accurate as of 2019-04-15 21:34:18 EDT and are subject to change. Any price and availability information displayed on http://www.amazon.com/ at the time of purchase will apply to the purchase of this product. Please check the ISBN that your instructor provided. If the ISBN-13 does not match this product (9781305630260) or its Printed Access Card equivalent (9781305630277) this may not be the correct product. In some cases, you may also require a course code from your Instructor. It's 1 AM, there are 20 tabs open on your computer, you lost your flashcards for the test, and you're so tired you can't even read. It'd be nice if someone came up with a more efficient way of studying. Luckily, someone did. 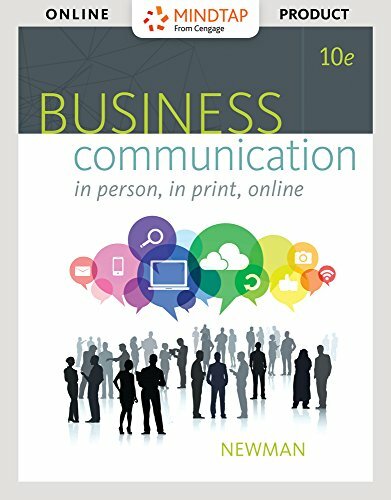 With a single login for MindTap Business Communication for Newman's Business Communication: In Person, In Print, Online, 10th Edition, you can connect with your instructor, organize coursework, and have access to a range of study tools, including e-book and apps all in one place! Manage your time and workload without the hassle of heavy books: the MindTap Reader keeps all your notes together, lets you print the material, and will even read text out loud. Need extra practice? Find pre-populated flashcards with the MindTap Mobile App, as well as quizzes and important course alerts. Want to know where you stand? Use the Progress app to track your performance in relation to other students. Access to this product is valid for 6 months of usage.